This tried and tested marine power pedestal has stood the test of time. The M2 series modular design continues to evolve and provide all services offered by the modern marina. 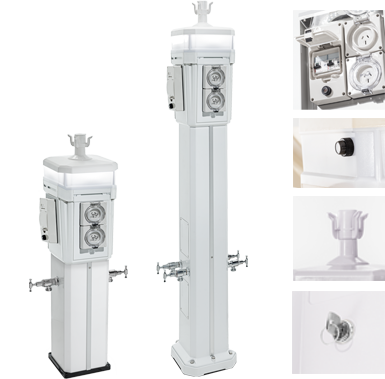 Buyers usually choose this model when they want to provide 15amp outlets, higher ampage outlets, water, light, meters and remote meter reading. Th M2-500 is a compact version that provides for a higher number of services. Add 15amp Power Outlets up to 4. Add 32amp or 63amp 3 Phase Outlets. Add up to 4 approved Din- Rail kWh Meters for user pay power. Proven in marinas under the harshest weather conditions. Easy access for electricians to all power outlets and electronics. White or paperbark colour to blend with the outdoor environment. Design and electronics fully compliant to the Australian/ New Zealand Standard – Electrical Installations (Marinas and recreational boats) AS/NZS 3004.1:2008. UV stabilised and resistant polycarbonate IP66 Power Outlets. Electronic Safety Switches – RCD/MCB.